In this installment of the series, we’ll hear from three San Diego Padres pitchers — Joey Lucchesi, Logan Allen, and Chris Paddack — on how they learned and developed their change-of-pace pitches. “I started off in a community college throwing a circle change. It was a regular changeup. Then I started throwing harder. I got stronger and my hands got bigger. As I went on to [Southeast Missouri State], I started developing it in a way that it moved differently. I hold it like a circle change, but it spins out like a slider and kind of drops like a curveball. “Once I got to the minors, Eric Lauer and I played catch every day. We decided to give it its own name. It wasn’t like a regular changeup, so we called it ‘The Churve.’ I’ve stuck with that name for three years now. “I had a buddy, Grant Holmes, who said he was messing around with a Vulcan change. I said, ‘What’s that?’ Basically, you pretty much split the ball with your middle and rings fingers, and throw it just like a fastball. 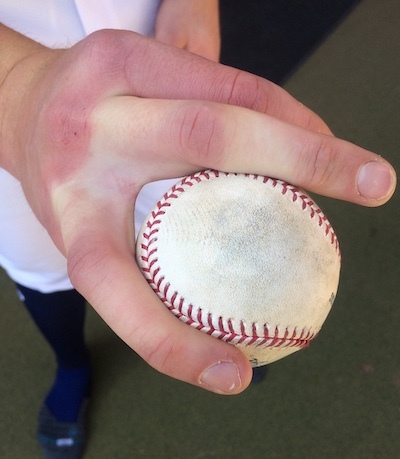 Logan Allen’s Vulcan change grip. “I toyed around with grips, feeling the laces and getting the ball a little deeper in my hand. I literally threw it with all of my arm speed, and it was dropping. It was tumbling. It opened up a whole new door for me that I’d never thought of going through. “My first year throwing it was 2017, when I went back to Fort Wayne. I’d messed around with it in the offseason, then brought it to spring training. Our staff loved it. Quite a few hitters I’ve pitched against in the minor leagues have said it’s one of the harder pitches to pick up, and to hit. “I was never able to get the feel for a circle change, but I also never really tried a conventional split. I never liked the feeling of the ball between my index and middle fingers. I was way more comfortable throwing the Vulcan change. I don’t know why. My hands aren’t very big, and for some reason the Vulcan just fits them better. 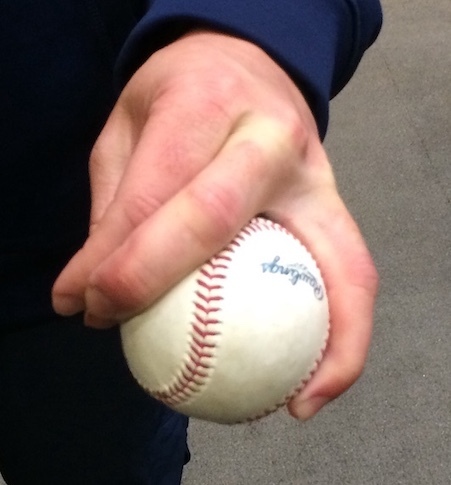 “Chris Paddack throws a version of it. His is a little different. It fades, almost like a regular four-seam change. It’s a very good changeup, but it’s not the kind of pitch I wanted to throw. I wanted to throw something with a little tumble that I could land for a strike and surprise the hitter, or that I could bury in the dirt. “A lot of the credit for my changeup goes to Calvin Schiraldi. I got the opportunity to pitch for him in summer ball throughout my high school years. We sat down and talked grips, trying to decide what fits me best. We kept working it and working it. It took about six months to develop. This was when I was 16 or 17 years old. 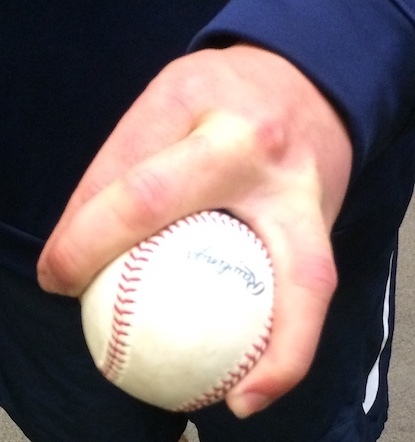 Chris Paddack’s Vulcan change grip. “He showed me a grip he’d used. It’s actually pretty unique. It’s kind of like a Vulcan changeup. It has split-finger action, in that it kind of falls off the table. The difference between mine and [Logan Allen’s] is that for me, these two fingers aren’t on the ball. “I started realizing how good of a pitch it was when coaches and scouts would say, ‘Hey man, your changeup is really good.’ When you’re a 17-year-old kid, you don’t really know what you have in the bag until other people start noticing, and giving you compliments. Yeah, man, I just continued to stick with the plan and throw it with intent. We hoped you liked reading Joey Lucchesi, Logan Allen, and Chris Paddack on Learning and Developing Their Changeups by David Laurila! Neat, thanks for insight and questioning these pitchers, David. I always find it fascinating getting to understand them from these types of reports and articles.